The Alkaline Diet – Miracle Cure or Just another Fad? The “Alkaline Diet” has been touted as a way to lose weight, gain energy and prevent diseases ranging from osteoporosis to cancer. Popularized by celebrities, there is no shortage of marketers willing to sell you books and kits to help you get started. But is there any proof that it actually works? 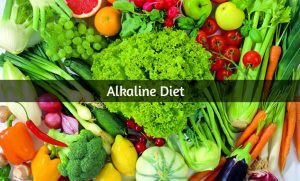 This article will examine the evidence to see whether the alkaline diet lives up to its claims. What Does “Alkaline” Mean Anyway? Alkaline is a scientific term to describe pH – which is a measure of the amounts of hydrogen ions and hydroxyl ions in a liquid. The more hydroxyl ions present, the more alkaline the liquid is. The more hydrogen ions, the more acidic it is. pH is important because it affects how other molecules behave. For example, metals like lead tend to be more toxic in water with a lower pH (1). People promoting alkaline diets think that having an acidic body environment is harmful, and that this diet will make our bodies more alkaline. The bottom line: Alkaline means having a pH greater than 7. On a pH scale, alkaline is basically the opposite of acidic. Alkaline diets encourage people to eat more alkaline-producing foods, and fewer acid-producing foods. When food is digested, it is broken down into molecules that have the potential to change the pH around them. Foods that contain a lot of phosphorus and sulfur have the potential to make their environment more acidic, so they are called acid-producing. Those with calcium, magnesium, and potassium are alkaline-producing. It is important to note that when people talking about this diet refer to “alkaline foods,” they are not talking about the pH of the food itself. Rather, they are talking about the molecules produced when food is digested. For example, tomatoes themselves are acidic, but they are alkaline-producing. According to proponents of the alkaline diet, it is healthier to eat alkaline foods than acidic foods, in order to create a more alkaline body environment. Some diets suggest an 80/20 ratio of alkaline-to-acid foods. In their thinking, the acidic environment created by acid-producing foods causes disease. By creating a more alkaline environment, they say diseases can be avoided or even cured. The bottom line: Alkaline diets promote foods high in calcium, magnesium and potassium, which create alkaline compounds when they are metabolized. Proponents say that creating a more alkaline body environment is beneficial. Can an Alkaline Diet Make My Body Less Acidic? It is important to note that our bodies do not have a consistent pH throughout. For example, the inside of the stomach is very acidic, which is necessary to break food molecules down during digestion. The layer of cells lining the stomach, however, is very basic – which prevents injury to the walls of the stomach. These differences are essential to the ways that the different parts of our bodies work. The pH of our blood is held in a very tight range of 7.35-7.40 (2). Our kidneys and lungs work very hard to keep this tight range, because it is necessary for our survival. The foods that we do NOT change the pH of our blood (3, 4). On the other hand, the pH of urine does change in response to the foods that we eat (3). Again, this is normal and an essential part of the way that our bodies operate. For example, if we eat bacon and sausage for breakfast, acids are produced as the meat is metabolized. These acids are quickly neutralized by bicarbonate ions in the blood. This reaction produces carbon dioxide and salts. The carbon dioxide is exhaled through our lungs, and the salts are excreted through our urine. In the case of proteins like bacon and sausage, the salts excreted cause our urine to temporarily become more acidic. The bottom line: Blood pH is not affected by the foods we eat. Urine pH, on the other hand, is affected by diet. Is Having Acidic Urine Harmful? It has been suggested that having acidic urine indicates an acidic body environment overall. This is simply not true. As mentioned above, the pH of various parts of our bodies varies widely, as it should in order to function properly. The pH of urine is not a good measure of overall body acidity (2). Having acidic urine after eating acid-producing foods indicates that our systems are working properly to get rid of extra acidic molecules. This is part of how we maintain appropriate pH within the body – by expelling what we don’t need in our urine. While one recent study of 50 women suggested that having more acidic urine may increase risk of urinary tract infections, this has not been confirmed (5). Others have suggested that it is the compensating that our bodies have to do in response to acid-producing foods that makes them harmful. That is, the mere fact that our kidneys and lungs need to work to counteract the acids produced may be harmful. This theory has not been proven. The bottom line: Urine pH is not an indicator of overall body pH, and there is no clear evidence that having acidic urine is harmful. Some proponents of the alkaline diet claim that it can treat or even prevent cancer. It is true that some types of chemotherapy work better in an alkaline environment. This is not true across the board, however – some types work better in an acidic environment. In addition, there is no evidence that an alkaline diet effects chemotherapy effectiveness (2). Remember, alkaline diets can affect the pH of urine, not of blood. Even if food could affect the pH of blood or other tissues, there is no evidence that a change in pH would prevent cancer cells from growing. Many experiments have successfully grown cancer cells in an alkaline environment (6). And while it has been shown that cancer does grow faster in an acidic environment, it is the cancer itself creates that acidic environment, not vice versa (7). There is almost no scientific research looking at the relationship between acidic or alkaline diets and new cancer occurrence. One observational study found no association between acidic urine and bladder cancer in men (8). No clinical studies have been done on this subject. The bottom line: There is no evidence that an alkaline diet can prevent cancer or improve chemotherapy effectiveness. Osteoporosis is a bone disease in which calcium and other minerals are lost. The result is weaker bones and increased risk of fracture. It has been claimed that acid-producing foods increase risk of osteoporosis. The theory is that when these foods are broken down during digestion, calcium-containing molecules are released from bone to neutralize the acid. When the calcium is no longer needed, it is excreted through urine. Alkaline diet proponents say this is a reason to eat fewer acid foods, and more alkaline foods. There is no evidence, however, that acidic diets remove calcium from bones. An observational study of over 6000 people looked at urine pH and risk of osteoporosis. They found no relationship between acidity of urine and either risk of fractures or bone mineral density (9). Two reviews of scientific studies also found no association between acidic diets and osteoporosis (4, 10). There is also no evidence that alkaline diets promote bone health (10, 11). Furthermore, an analysis of studies to-date found no relationship between acid in urine and calcium balance –a measure of the total amount of calcium in the body (12). If acid-producing foods were a cause of osteoporosis, you would expect that diets high in protein, including meat and dairy (which are acid-producing), would increase risk. To the contrary, most large studies have shown that higher protein intake is beneficial for bone health (13). Diets high in protein have been associated with lower risk of fracture, and higher bone density (14). In the elderly, eating too little protein is a greater problem for bone health than is protein excess (15). The bottom line: Promotion of alkaline diets to protect bone health is not justified by evidence. Acidic diets do not increase risk of osteoporosis, and alkaline diets do not protect from it. Alkaline diets have also claimed to help avoid muscle loss (sometimes called muscle wasting). One hypothesis says that when acid-producing foods are eaten, the kidneys must steal amino acids from muscle tissue to neutralize it, thereby breaking down the muscle (16). Studies testing this hypothesis have not looked at nitrogen balance, which is the measure of total amount of nitrogen in the body (17, 18). It is impossible to say whether nitrogen in urine is coming from muscles being broken down or some other source. It has also been suggested that acidic diets lead to muscle loss by increasing cortisol (a stress hormone). Prolonged high levels of cortisol can promote muscle breakdown (19). However, a study looking at a high-carbohydrate meal versus a high-protein meal measured levels of cortisol in saliva, and found no difference (20). One study that claimed alkaline diets may prevent muscle wasting in older adults. However, the authors did not measure the acid- or alkaline-loads of the diets of their participants. Instead, they measured potassium levels in urine. They found that urinary potassium was associated with higher muscle mass, and concluded that fruits and vegetables may help preserve muscle (21). Perhaps this is true, but it does not provide evidence that alkaline diets prevent muscle loss, or that acidic diets cause muscle loss. The results of other studies have been mixed. One observational study reported a small association between alkaline foods and increased muscle mass (22). On the other hand, reviews on the topic and many large studies have shown higher protein (acidic) diets are associated with higher muscle mass (23, 24, 25). The bottom line: There is no clear evidence that alkaline diets prevent muscle loss. No scientific studies have looked at whether alkaline diets cause weight loss. That said, any exclusionary diet – one that excludes specific foods or entire food groups – may result in weight loss simply by causing you to cut out many of the foods that you would normally eat. This has nothing to do with food pH; rather it is because cutting out food groups is also causing you to cut out calories. The bottom line: An alkaline diet may or may not result in weight loss, but there is no evidence that weight loss is associated with alkalinity of foods. Is an Alkaline Diet Healthy? While there is no evidence that this diet is a miracle cure, it does have some positive aspects. It encourages more fruits and vegetables, which most Americans get far too little of. Fruits and vegetables are nutrient-dense and full of fiber and healthy phytochemicals. People who eat more fruits and vegetables have lower risk of many chronic diseases, including heart disease, cancer, stroke and diabetes (26). Cutting down on red meat and processed meat, which studies have linked to cancer and cardiovascular disease, is also not a bad idea (27). Unfortunately, the diet also excludes healthy foods like whole grains and fish. These foods are important sources of fiber, minerals and healthy fats. Both whole grains and fish have many important health benefits and have been shown to decrease risk of disease (28, 29). The bottom line: While including more fruits and vegetables is a good idea for most of us, the diet also excludes healthy foods such as whole grains and fish. There is no evidence to suggest that adopting an alkaline diet will help with weight loss, muscle retention, or prevent cancer or osteoporosis. These diets do encourage eating fruit and vegetables, which most Americans do not get enough of. However, diets that exclude whole food groups (including healthy ones like fish and whole grains) can result in nutrient deficiencies. Finally, if you’re following my nutritional recommendations you are already benefiting from all the “pros” as the alkaline diet – as we encourage lots of vegetables, some fruit, leaner proteins, healthy fats and a focus on REAL food. « Nutrient Timing – Does it matter? This thoughtful examination of the research is much appreciated. Thank you.